Pattern, in the broadest sense of the word, is a particular way something is done or organized. In the arts, pattern is a repeating motif that gives order and structure to a work. Pattern can be natural or man made. Natural patterns can be things like waves, spirals, spider webs and crystals. In art, music, architecture and design, pattern and repetition please our senses and give order and symmetry. The Fibonacci number pattern is one sequence found in nature (think pineapples, nautilus shells and pine cones) and is also explained by mathematics. Pattern and repetition are major tools in a jewellery designer's arsenal, along with colour, texture and type of material used. Pattern can create visual cohesiveness in your design while at the same time offering visual variety. What a paradox. But what a great paradox too. 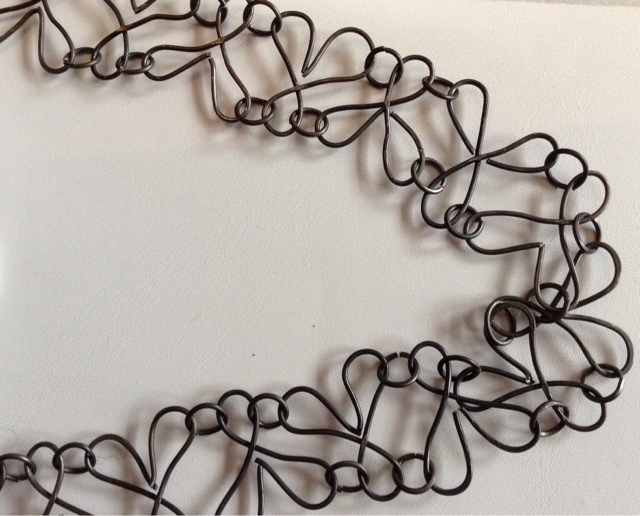 For instance, I created a necklace that was meant to showcase some of the infinite patterns you could achieve on metal using the rolling mill. 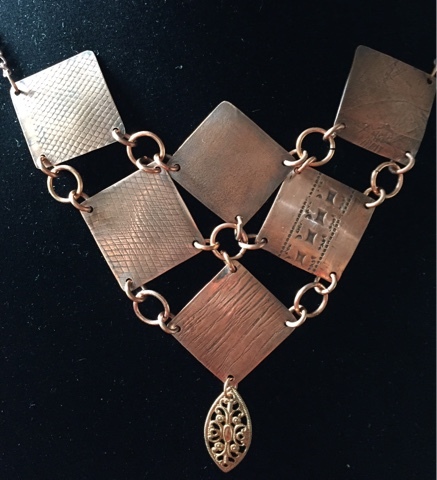 I used the same, repeating 1" x 1" squares of copper and put them together in a pleasing arrangement that mimicked a bib design but gave each piece its own pattern (from paper to netting to screen door and more) to enhance the visual interest of the piece. I added the drop at the end. If I go back and make another one of these necklaces I think I'd choose a brass pattern plate on one square that picks up the scroll motif in the brass stamping. Come into the store, open up your mind and your stash, and let pattern rule your next creation. I'd love to see what you come up with.